I am going to be in a very cool show that opens this week at Lillstreet Gallery in Chicago. (Please refer to the diagram in the top left corner and follow along.) The show is made up of work from five pairs of artists. Each ceramic artist made 1 piece(s) from start the finish and another piece(s) halfway. Then traded the leather hard piece with their partner. The partner decorated, finished and fired the piece(s). Each pair will display their four pieces. I haven’t seen any of the other pieces yet, so I am really excited to see what everyone did. This show is part of Chicago Artists Month and the Ravenswood Art Walk. We did a slightly different incarnation of the show last year. 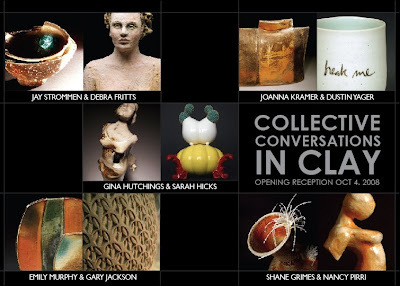 You should definitely check out it out: Being to Being: Collective Conversations in Clay. I think this is an exercise that every ceramic artist should try. You learn so much about your own work and your approach to it by seeing your form through someone else’s eyes. I will be posting pictures of the show soon so you can see the work even if you’re not in Chicago. This is a virtual tour of a show that I am currently in: Being to Being: Collective Conversations in Clay at Park West Ceramics Gallery in Chicago. The concept for the show is very unsual (remember, I like unconventional things…). Here’s the idea: There are 5 artists, all with different styles of making and decorating. Each artist made 5 pieces. One of the pieces is made start to finish by that original artist. The other 4 pieces are handed off in the leather hard stage to the other 4 artists. Each participant decorates the 4 pieces from the other artists. Carving and cutting, slips and glazes, adding clay pre- and post firing, atmospheric firings and decals were some of the techniques used. Platter by Emily Murphy. Soda fired with a crackle slip and sprayed glazes. top left: Slipped wood fired with low fire decals by Gina Hutchings. top right: Cut, carved, slipped, glazed and wood fired by Jay Strommen. bottom left: Slipped, glazed, punctured, reduction fired, then sewn by Joanna Kramer. bottom right: Cut, then applied stoneware “staples” and porcelain coil then soda fired by Shane Grimes. The next series are porcelain hand built slab “landscape” vases by Joanna Kramer. Below is her solo piece that is actually two porcelain vases that are sewn together (post firing, of course!). top left: Glazed and wood fired with low fire decals applied by Gina Hutchings. top right: Slipped, glazed, cut and carved then wood fired by Jay Strommen. bottom left: Slipped, glazed and soda fired by Emily Murphy. bottom right: Slipped and carved with stoneware staples and porcelain coils attached and then soda fired by Shane Grimes. Jay Strommen‘s pieces are thrown and altered with slips and lightly glazed then wood fired. top left: Slipped, glazed, wood fired with decals by Gina Hutchings. top right: Slipped, punctured, glazed and reduction fired then sewn by Joanna Kramer. bottom left: Lots of stoneware staples and porcelain coils added, then soda fired by Shane Grimes. bottom right: Slipped, carved, glazed and then soda fired by Emily Murphy. The next group is from Shane Grimes. Shane’s pieces are thrown and altered. His solo piece has his trademark stoneware staples and incredibly thin porcelain spines/coils attached, then soda fired. top left: Cut, carved, slipped, glazed and wood fired by Jay Strommen. top right: Soda fired then a decal applied by Gina Hutchings (it’s a very cool spider). bottom left: Slipped, cut, punctured, glazed and reduction fired by Joanna Kramer, then sewn. bottom right: Slipped, glazed and soda fired by Emily Murphy. The Geisha series is by Gina Hutchings who is also the organizer of the show. Her piece below is glaze and wood fired with a decal applied. top left: Stoneware staples and porcelain coils attached then soda fired by Shane Grimes. top right: Slipped, punctured, glazed, reduction fired then sewn by Joanna Kramer. bottom left: Slipped, carved, glazed and wood fired by Jay Strommen.